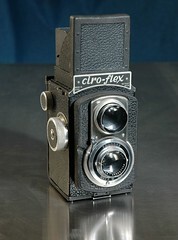 The Ciro-flex was a series of 6x6 TLRs made by the American manufacturer Ciro beginning circa 1941. All share a strong resemblance, with uncoupled red window film advance and Wollensak lenses & shutters. 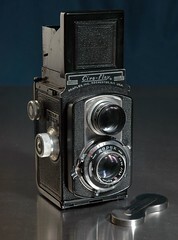 By using a slightly longer-than-normal 85mm focal length, sharpness in the corners of the 2¼×2¼-inch image remained adequate even with a less-expensive triplet lens design. 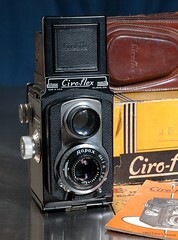 The earliest model A's were built in Detroit, Michigan; and "ciro-flex" appears uncapitalized on the nameplate. 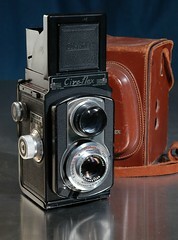 Post-WWII production resumed with the models B ( with an Alphax shutter) and C (Rapax shutter). By 1947 the company had relocated to Delaware, Ohio. 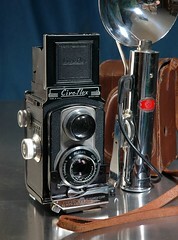 After Graflex bought out Ciro's camera lines, the Ciro-flex design continued with some minor changes as the Graflex 22. 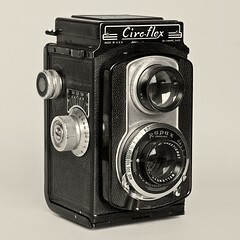 An outstanding collection of Ciro-flexes from PhotoShop Guru on Flickr.